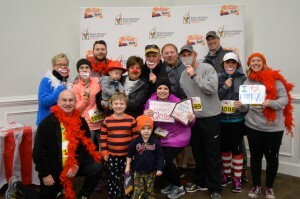 The 12th Annual Red Shoe Run took place on January 23rd, 2016 and despite the weather scare, it was a successful event! The weather projected that Friday afternoon, Birmingham would see some ice, wind, and snow, and that we did. As we worked closely with our race director, Allison Stone with Cadence 180 Consulting, and the Homewood Police and Mountain Brook Police Departments, we were given the green light to go on with Saturday’s event as planned. 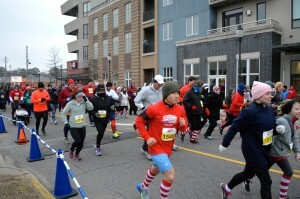 Saturday morning came early and runners came up bundled from head to toe ready to embrace the cold running temperatures. Late packet pickup and registration took place before the races began inside of our Rosewood Hall in downtown Homewood. Participants were greeted at the door with a coffee and hot chocolate station courtesy of McDonald’s to get them warm and toasty before their race began. Our 10 mile, 5K, and 1-mile fun run all started on time while bystanders watched and cheered as the runners set out to embark on a cold morning run. During and after the races, participants and their guests had plenty to do inside Rosewood Hall! The Kids Area featured a special craft project from The Home Depot, games provided by McDonald’s and RMHCA, and even photo booth fun. Kids and adults alike enjoyed building wooden baskets, tossing McNuggets into the McNugget box, and posing with their red noses and boas with our special guests– the Minion, Spongebob, Hello Kitty, Bumblebee the Transformer, and even Ronald McDonald himself! Vendors were also set up with some extra goodies for our participants! Sprouts, Gold’s Gym, Barber’s Milk, H&R Block, and Virginia College. Post-race food was a big hit as the runners started coming in from the finish line! The smell of McDonald’s oatmeal, fruit from Sprouts, and Clif Bars led them down the right hallway to fill their stomachs and wash it down with water provided by Jason’s Deli, H&R Block, and United-Johnson Brothers and Powerade courtesy of Coca-Cola. Throughout the morning, music was provided inside by Amerson Events, and our emcee for the event was ABC 33/40‘s own Honora Gathings. Honora did a fantastic job in her first year as emcee as she kept our participants and guests informed on the start times, as well as made other announcements about the day. The races concluded and our 10 milers were awarded with our inaugural finisher medals upon crossing the finish line! Shortly after all runners made it back, our awards ceremony was kicked off by the announcement of our fundraising winners! This year’s top team for the 2nd year in a row was from none other than our presenting sponsor, McDonald’s and their team– Max’s Angels bringing in over $3,000! Our 2nd place fundraising team was Team Angel Heart Warriors and was a combination of two of our own previous guest families– The McNutts and the Simpsons. Team Angel Heart Warriors brought in over $2,3oo! Our top individual fundraiser for the 2nd year in a row, was a member of the Max’s Angels team, Dennis LeBlanc raising $1,130 by race day! Way to go Dennis! Finishing up our fundraising recognition, every individual who raised $100 or more on their fundraising page was entered into a drawing to receive a $500 Visa gift card. The winner of the drawing was a member of the Max’s Angels team, Jason Black! Jason was also our 2ndplace fundraiser, raising over $900. Jason chose to donate his gift card back to RMHCA and this moment sent the whole room into a roar of applause. Thank you, Jason! 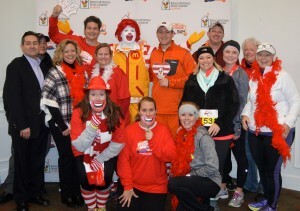 Our overall winners for each race and all age group winners were announced and invited to the front to receive their award – a 12th Annual Red Shoe Run water bottle, and pose for a picture with Ronald! Despite some of our participants getting iced in and not being able to travel to Birmingham for the race, we had a fantastic morning and could not have pulled it off without the help of so many! A big thanks goes out to our race director, Allison with Cadence 180 Consulting, Set-Up Events, Homewood Police Department, Mountain Brook Police Department, whose main goal is to coordinate the course, supply the water stops, provide the chip timing for the 10 mile and 5K runners, and to keep our participants safe on the course. We already can’t wait until next year! Stay tuned for the announcement of the Red Shoe Run 2017 date! Looking for information on tshirts, awards, pictures, etc. Check out our Red Shoe Run page! RMHCA qualifies as a 501(c)3 and therefore contributions to RMHCA may be tax-deductible to the fullest extent allowable by law. 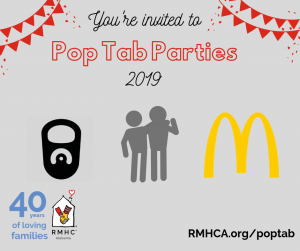 We’re coming to a McDonald’s near you for the 2019 Pop Tab Parties! Everyone is welcome to drop off their tabs and grab lunch. Click here for the full schedule.